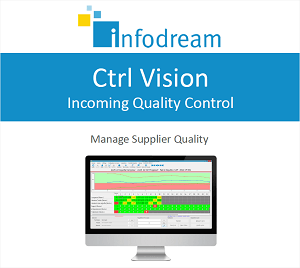 Qualaxy Control (formerly Ctrl Vision) is a reception control function for monitoring and managing incoming and outgoing production quality levels. Based on ISO2859 and ISO3951 quality standards, it allows you to confidently accept or reject production lots using proven data driven methods. Our incoming quality control software does all the hard work for you: using statistical sampling theory, AQL (acceptable quality level), SPC charts and historical supplier performance. It provides a simple and fast accept/reject decision. Supplier monitoring: Key tool for monitoring suppliers and controlling both incoming and outgoing final quality levels. Time-saving: Qualaxy Control is a dynamic tool which will automatically increase or decrease the level of inspection and control required to ensure confident and accurate decisions are made by inspectors. Plus: Monitor not only your ISO alarms but also variation and changes in your dimensional measurements (SPC alarms).